Here's an easy Patriotic festive dessert! Your imagination will let your dessert be the talk of any party! Add layers of star cut jello if you have time for the perfect festive look! blue then a bowl of red jello. Layer jello with whipped cream and fruit in between in a large big bowl to make a trifle! Top with cut out watermelon stars for decorations! It doesn't matter if you feel you don't have a creative imagination my tips will get you started. Make the jello to package instructions and pour into small rectangular fudge size pans to make at least 1 inch thick. Refrigerate until firm. 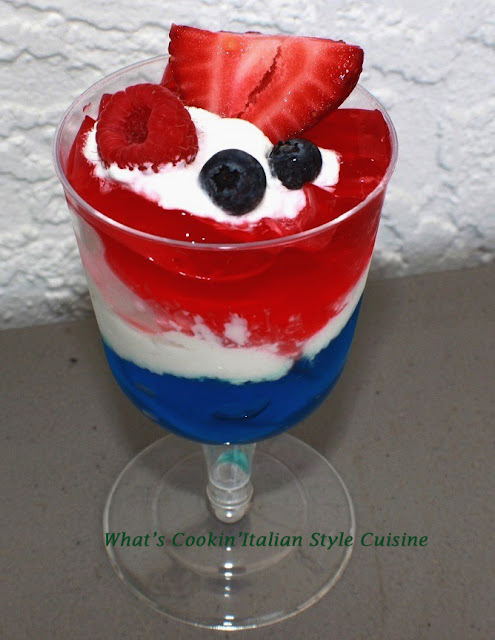 Then you can scoop into a parfait glass by each color alternate, or martini glass layered with blue, whipped cream then red jello. Top with fruit suggestions and whipped cream. Chill. Unmold the jello and scoop or cut into cookie cutter shapes. You can cut out any shapes you like a star shape or anything else pertaining to that holiday, using a cookie cutter. Layer with blue, whipped cream, red jello. Layer one color at a time. Refrigerate blue until firm. Add whipped cream, pour the red layer. Refrigerate. Make a pan of blue then red in separate pans of jello. Cut out with star cookie cutter making several stars of each color. Add stars in a trifle dish to the outside of the glass dish. Fill the trifle dish with whipped cream alternating with more stars of jello through out the bowl. Top with cut outs watermelon stars using a small cookie cutter star shape and add blueberries, strawberries or/and raspberries. Fill a pre made cooked pie crust adding some fresh star cut out fruits using watermelon, cantaloupe, or any kind of melons you can make out of star cookie cutters. Or just use all whole Strawberries adding a premade glaze,topping then add whipped cream garnish and then some cut out stars of fruits on top. Add some blueberries and raspberries for extra color.